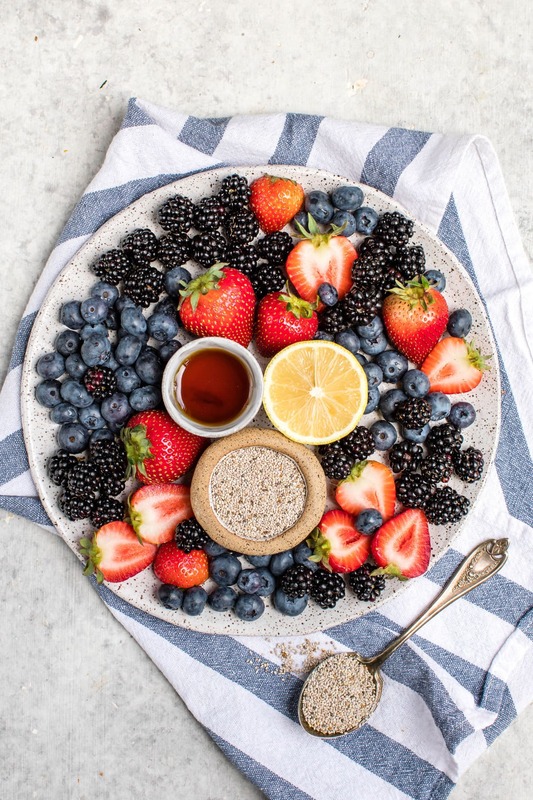 Skip the refined sugars and make your own healthy Chia Seed Jam using only 4 basic ingredients! It’s perfect on toast, in oatmeal, on sandwiches, and more. 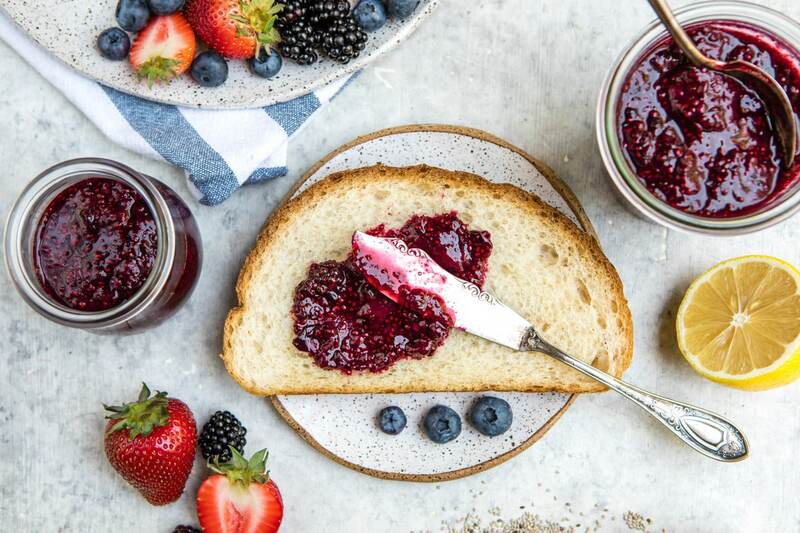 Chia Seed Jam is an easy and healthy alternative to store-bought jams and jellies. It’s made with only 4 plant-based ingredients, comes together with only 15 minutes of work, and is incredibly customizable! Let’s get into it, shall we? 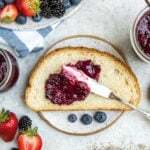 Store-bought Jams and Jellies, while tasty, are often overloaded with refined sugars and other preservatives. If you are looking to avoid these, Chia Seed Jam is a great alternative! 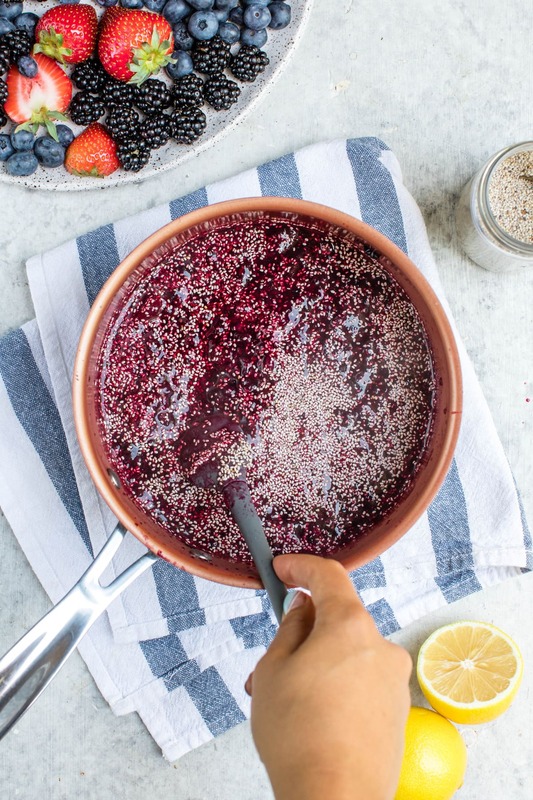 If you are unfamiliar with the concept, it’s simply cooking down any Berry of your choice with Chia Seeds and (optional) Liquid Sweetener until it becomes a thick, jam-like consistency. 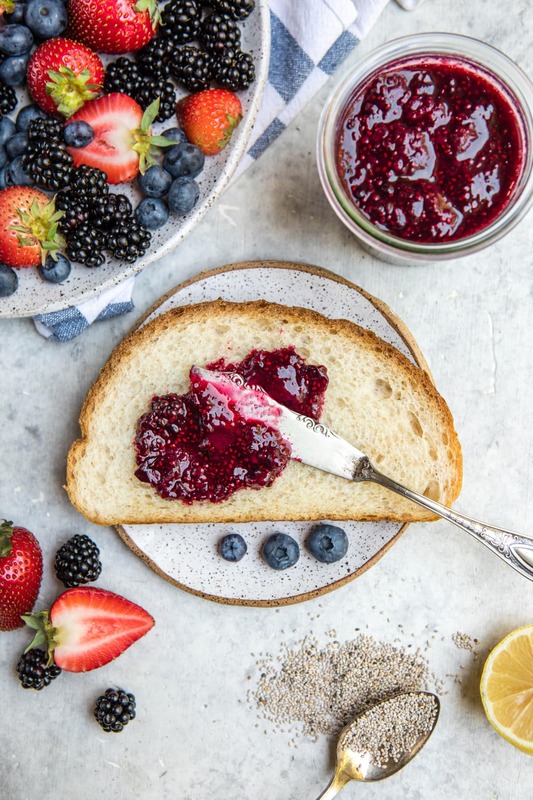 Berries have a high water content, which is why they work so well with Chia Seed Jam. I used a combination of Strawberries, Blackberries, and Blueberries for my jam, but you can use whatever berry you have! 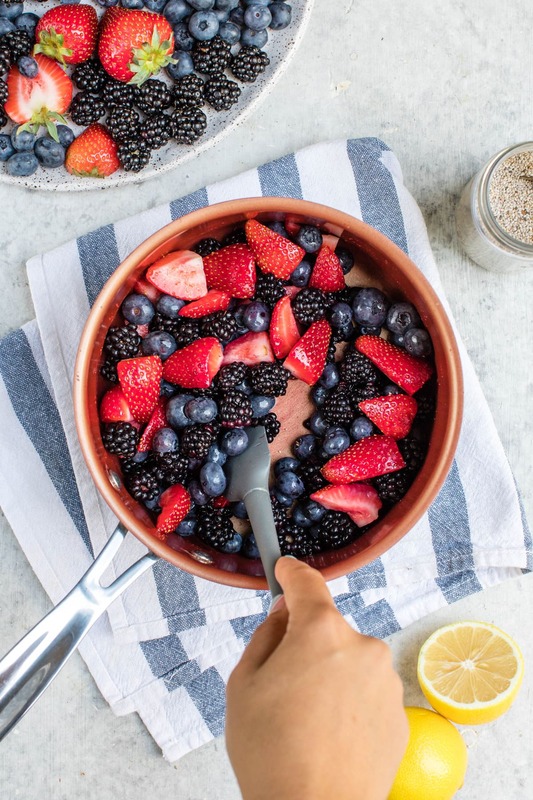 Frozen berries work just as well as fresh, though they will increase the cooking time slightly due to their higher water content. 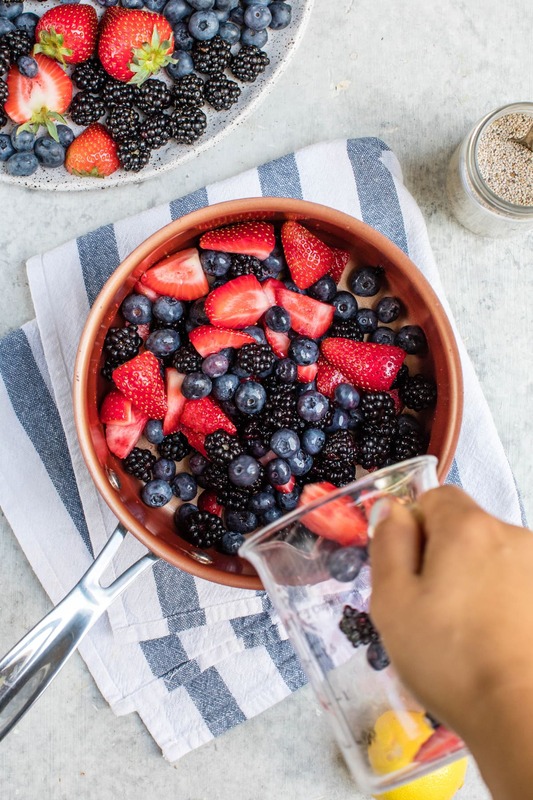 You’ll only need about 1/4 cup of Filtered Water to help “get things going” and steam the Berries before they naturally start to release liquid on their own. Every Berry is different, so Liquid Sweetener may be totally optional! If you are looking to completely reduce your sugar intake and have relatively sweet berries, you can leave it out. I like to add around 1 tbsp of Maple Syrup to my Chia Seed Jam – it doesn’t make it too sweet, but just sweet enough to help round all of the flavors out. The heat will cause the Berries to naturally “break down” and release liquid. I like to stir the mixture occasionally to ensure nothing sticks to the bottom of the pot; I also like to mash some of the Berries during this time to help speed things along and get a smoother “jam” consistency. 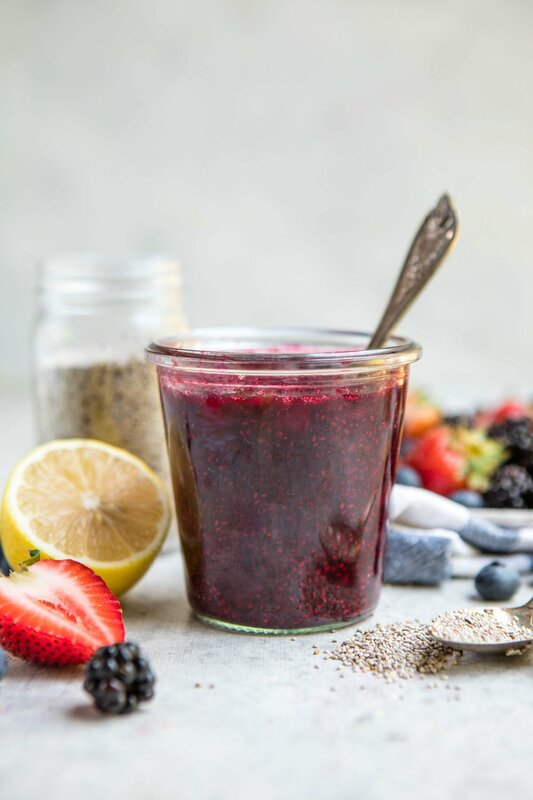 The Chia Seeds will not only help to thicken the Jam, but are also a great source of fiber, healthy Omega-3 fats, and Calcium. Did you know that Vitamin A (which is common in berries) is Fat-Soluble, meaning that it absorbs into the body better with a source of fat? Adding Chia sounds like a win-win to me. I like to use whole Chia Seeds, but if you’re not a fan of their “crunchy” texture, you can also purchase ground Chia instead. 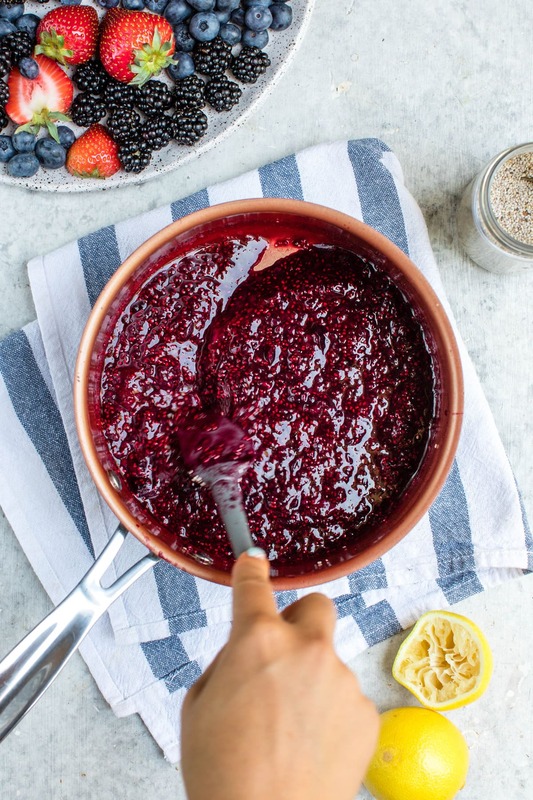 The amount of Chia Seeds you add to your Jam will determine its thickness. I prefer to have a smooth and spreadable jam, so I only added 2 tbsp. If you’re looking for a thicker “jelly,” I would suggest 3 tbsp! The good news is that you can always start with less seeds and add more if you think your jam is too runny. Add a splash of Lemon Juice, then you’re good to go! 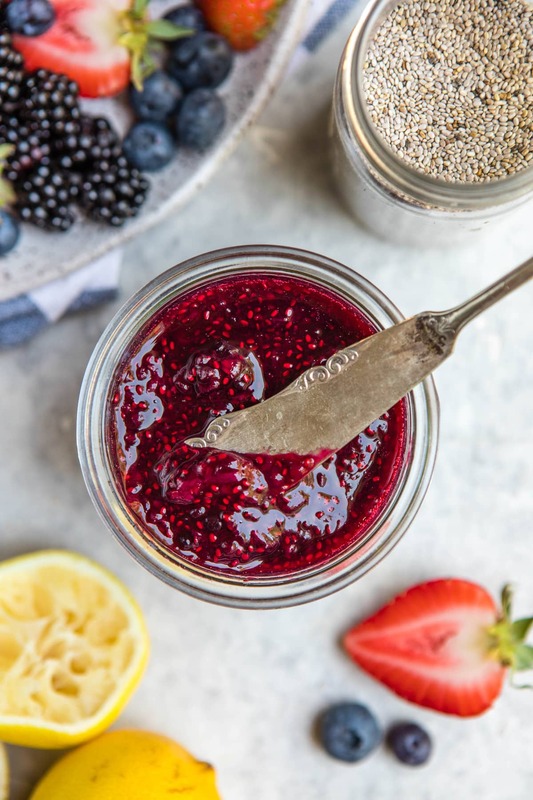 I like to finish off my Chia Seed Jam with a squeeze of fresh Lemon Juice because I find the addition of a little acidity really helps to bring out the flavor of the berries and complete the flavor profile of the Jam. If your berries are particularly sour or you opted to omit the Liquid Sweetener, you may want to skip this step. I like to store my Jam in an airtight glass container in the fridge, where it’ll last between 7-14 days. If you don’t think you’ll use all of your Jam before then, you can always cut the recipe in half! 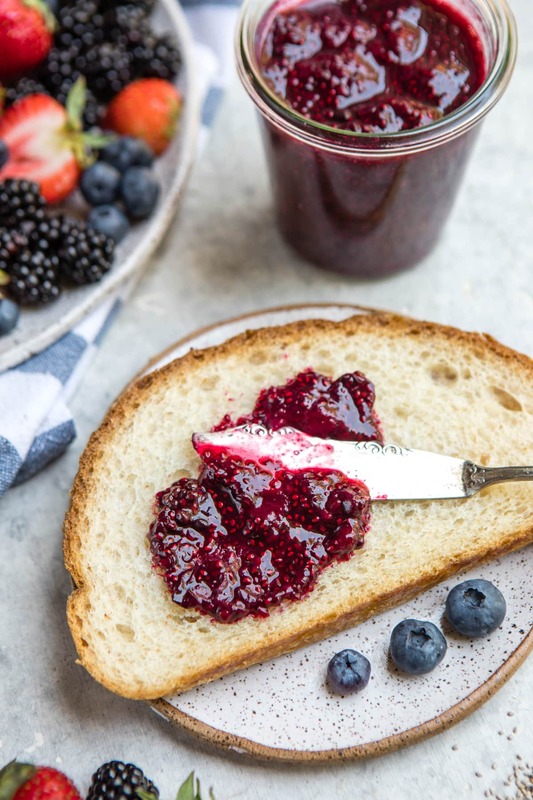 Speaking of Jam uses…you can use this healthy Chia Jam pretty much anywhere you would use regular Jam or Jelly! My favorite ways to use it is spread over Toast or on top of Oatmeal, but it would also be great in Thumbprint Cookies, in PB&J Sandwiches, or even as a sweet dip for Sweet Potato Fries. If you’re looking for ways to use this Chia Seed Jam, check out this Creamy Zucchini Oatmeal, or spread some over this Vegan Zucchini Bread! First, add the Berries, Water, and Maple Syrup to a nonstick saucepan. Bring the mixture to a boil over medium, heat, then reduce the heat to medium-low and simmer for 10-12 minutes, stirring occasionally. Try to “mash” some of the berries as you stir, though the heat should break them up as well. Remove the pot from the heat and add the Chia Seeds to the pot; mix until well incorporated, then let sit for 5-10 minutes. Finally, stir in the juice of ½ of a Lemon, and transfer the mixture to a glass jar. Use as desired, and store in the refrigerator for 7-14 days. I used a mixture of Strawberries, Blueberries, and Blackberries for my jam, but you can use any combination (or single Berry) of your choosing! 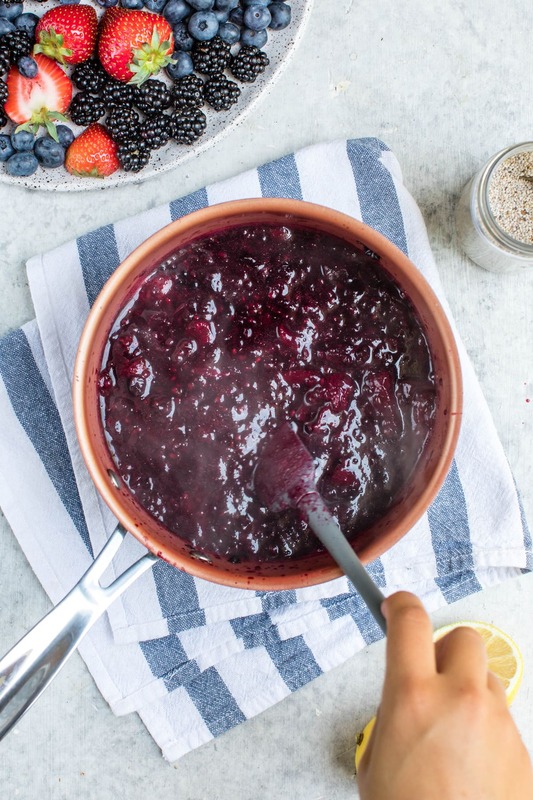 You can also use frozen berries to make the jam, though you will need to simmer the mixture for 2-5 minutes longer, as they hold more liquid. I have not tested this recipe using any other fruit aside from Berries. They hold a lot more water than other fruits, which is why they work well in this recipe! You can substitute stone fruit or another fruit of your choice, though do so at your own risk. Maple Syrup may be substituted for any other sweetener of choice. I would recommend Agave, but Coconut Sugar or another granulated Sugar will work as well. Keep in mind that each sweetener has different “levels” of sweetness, so you may need to adjust the amount of sweetener accordingly. I just made this recipe! It is absolutely delicious! Definitely going to be using it on my toast for breakfast :). Do you know how long it will last ? Thanks !!! Going to make when I get out of work !!!! 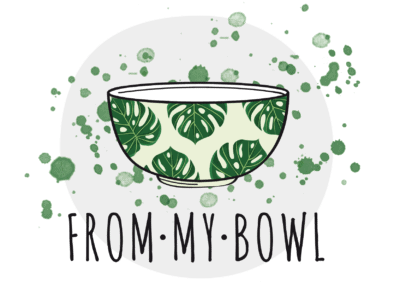 love your recipes and I love seeing new ones pop up in my email !!! How many cups of berries should I use?? Sorry! Just saw that when I came back. This is great! I spoon it in unflavored greek yogurt, pretty much every day. I used orange juice instead of lemon juice and then didn’t add any maple syrup. I had some very fresh and sweet fruit, so will keep the syrup in mind after the summer winds down. Thanks! Love that you used OJ! This recipe was so easy and tasty! I had a bunch of berries in the fridge that were getting too ripe and this was the perfect way to use them. I have no excuse to ever again buy processed jam from the store, when homemade healthy jam like this is so easy! What’s the difference between using filtered water and tap water? Tap water (depending where you live) may not be the best thing to drink, which is why I always advise using filtered just in case! I made this for my daughters pb&j sandwiches and she loves it as do I! After I cooked the berries I blended them in a food processor and then added the chia seeds. Came out perfectly smooth! Does this jam recipe freeze nicely ? It should hold up okay, but is definitely better fresh! Do you think you could process this is a canner and keep it more shelf stable? Could I use frozen berries for this recipe? I was so excited to make this jam this morning that I had trouble falling asleep last night because I kept thinking about it! I’ve always wanted to make jam and was so surprised at how easy this looked and it was the first thing I did this morning! The consistency is perfect. I used blueberries and 3 strawberries I had laying around, I used 2 tbs of chia seeds and I also added an extra tablespoon and a half of maple syrup just because I wanted it to be extra sweet. I’m glad you enjoyed it, Isabel! 🙂 I definitely know that excited feeling that comes with trying a new food or recipe! Caitlin, have you tried using fruit juices in this recipe? I’m not talking about things like juicy juice, I’m talking about all natural or homemade juice. I have not, are you thinking of adding some to infuse the jam? Just wondering if a person could freeze some as I can not use it in 14 days? Can I sub the chia seeds for psyllium husk? I imagine you could, but I have never tried that! Just made this jam. The flavour is lovely but I’m not sure I like the texture because of the chia seeds. Also, when I was washing up I ended up with pesky chia seeds glued to my washing up sponge and apron! Is there a way to wash up without this happening? Hi Hazel! If you don’t like the texture of the Chia, you can place the thickened jam into a high-speed blender and blend until smooth. As for the Chia Seeds sticking, it helps to clean them up ASAP before they have a chance to dry!